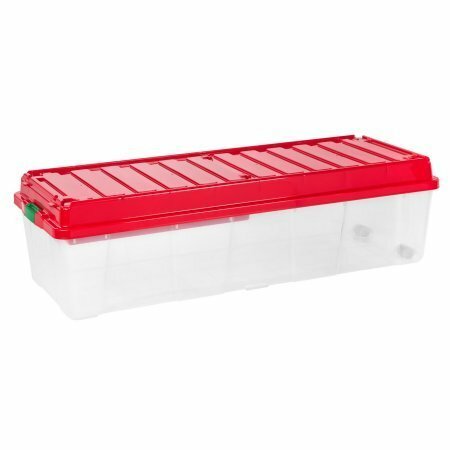 This tree storage box is great for storing artificial trees, porch trees, and artificial decorations. The lid buckles securely in place to keep dust, insects, and rodents out of holiday dcor, and the built-in compartment is perfect for storing small decoration such as ornaments, tree skirts, and garland. Built-in wheels on one side make it easy to transport the box. Simply grab underneath the buckle on the opposite side and youre on your way. Holds most 7ft trees or 4ft sections. If you have any questions about this product by IRIS., contact us by completing and submitting the form below. If you are looking for a specif part number, please include it with your message.